Moisture Mitigation | Is Your Concrete Floor Dry Enough? 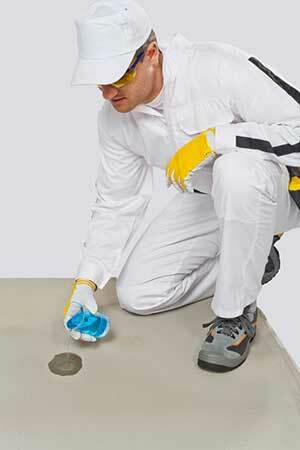 An Ounce of Prevention: Is Your Concrete Floor Dry Enough? It's a sad fact, but your concrete floor can have a moisture vapor problem. In a dry environment, the water in your concrete flooring may evaporate rapidly. In a moist environment, it may not evaporate at all. It all depends upon how the concrete was made and poured, when it was done and the climate you live in. The problem with moisture, of course, is that it can ruin your floor. The liquid water contains dissolved alkaline salts which can condense beneath the flooring. That's where you'll get blisters and puckered and peeling areas, among other problems. As part of our process, we test for moisture vapor emissions. Yes, even existing concrete floors can have moisture vapor emissions that exceed the allowable limits for epoxy floor installations. If you do have moisture problems, then we'll apply an epoxy-based primer that will effectively reduce moisture vapor emissions in concrete slabs as high as 20 pounds per 1,000 square feet per 24 hours to less than three, thus allowing resinous floor systems to be installed on concrete slabs as soon as 5 - 7 days after being placed. Good news: the product we use warrants this moisture reduction performance for a full 10 years. We believe in peace-of-mind. That's why we'll do a moisture vapor test before we begin any work.